‘Walking Dead’ Burning Questions: Is There a War Brewing? We knew it would only be a matter of time before “The Walking Dead’s” Governor showed his true colors. Can he take orders from anyone else? Nope. The girls like staying in the camp because they feel safe, but the Gov is a little skeptical – and he especially doesn’t want Martinez to tell them anything about Woodbury. In an opportune moment, G bashes Martinez in the head and throws him into a walker pit, making it look like Martinez accidentally fell in while drunk. Pete, the guy who steps up to lead after Martinez died, isn’t any better. Will Lilly ever find out what went down at Woodbury? She’s bound to. She’s been asking Brian about it, but he isn’t talking. She has no idea what’s she getting into. 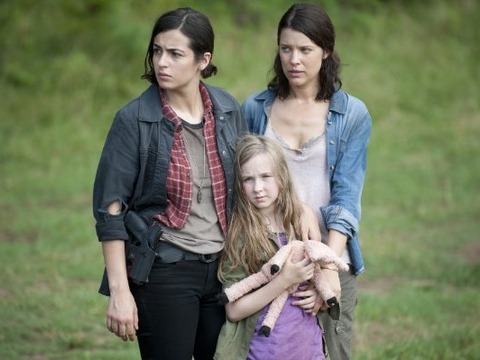 Will the Governor take off with the girls and find a new place? He tries to after he sees how things are deteriorating. The Gov drives away from camp with Lilly, Meagan, Tara and Tara's new girlfriend, Alicia, in tow. He slams on the brakes when he finds that the road out of town is blocked by a "moat" of walkers constructed to keep people out -- or maybe in. What will G do next? Go back to the camp, kill Pete and take over as new leader. #MeettheNewBoss. Will Lily or Meagan make him a better leader? Actually, they are making him even more dangerous. When Meagan is almost bitten by a walker in the camp, the Governor is only more determined to find them all some place safe to live. Where would that be? Yep, it’s the prison. G hasn’t forgotten his old nemeses, Rick and the gang. Let the war games begin.